For each bit of warming that continues to occur, climate changes are locked in for centuries and related costs soar. For instance, worldwide last year $330 billion in damage was caused by climate change, according to Massachusetts venture capitalist Jeremy Grantham who gave a recent talk at Bittersweet Farm in Westport, Mass., about climate change. He said denying or even failing to understand climate science is a costly mistake. He noted that in India, China and Europe climate science isn’t even debated. In the United States, the United Kingdom, Canada and Australia it’s a common practice. When it comes to adequately dealing with climate change, he said, capitalism often gets in the way. The time is now to invest in those changes, profitable or not, as failure to act aggressively will cost everyone plenty. For example, as the Northeast has witnessed in the past week alone, more frequent and intense storms have quickly become the norm. The number of severe weather events didn't start multiplying overnight. It just seems that way, because climate change has long been ignored. Over the course of the 1970s, there were 660 reported disasters worldwide, including droughts, floods, extreme temperature events, storms and wildfires. In the 2000s, there were 3,322 such events, according to author and 350.org board member Naomi Klein. Hurricane Irene in 2011 caused about $10 billion in damage, just a fraction of the some $380 billion in total global damage caused by disasters that year. A year later Superstorm Sandy caused an estimated $65 million in damage. Both storms were considered modest for this climate-change era. In southern New England, where both Irene and Sandy inflicted heavy damage, the risks associated with climate change, especially sea-level rise and storm surge, are profound. Twenty-one of Rhode Island’s 39 communities are on the coast. Connecticut has 24 coastal communities, which are home to about a third of the state’s population. In fact, about half of the region’s population and a treasure trove of landmarks and historic sites dot southern New England’s coast. Boston and Scituate, Mass., Wickford, Matunuck and Misquamicut in Rhode Island, and Old Lyme and Groton, Conn., are some of the region’s most-vulnerable areas. Last year the National Oceanic and Atmospheric Administration increased its sea-level rise projections to up to 8 feet by 2100. NOAA modeling also projects the Northeast to experience an additional 1-3 feet of rise. Groton, a city with 20 miles of coastline on the Long Island Sound, is experiencing more frequent flooding along its coast and rivers. Route 1, the city’s main east-west roadway, is flooding more often. A 2014 report by the Union of Concerned Scientists lists Boston among the 30 most at-risk historic areas across the country and notes that the city is one of several along the East Coast experiencing more frequent and severe coastal flooding and more intense storm surges. If Superstorm Sandy, for example, had hit six hours later, at high tide, about 6 percent of Boston would have been flooded. Since 1921, when such record keeping began, Boston has experienced high tides at least 3.5 feet above average 21 times, and half of those instances have occurred in the past decade. 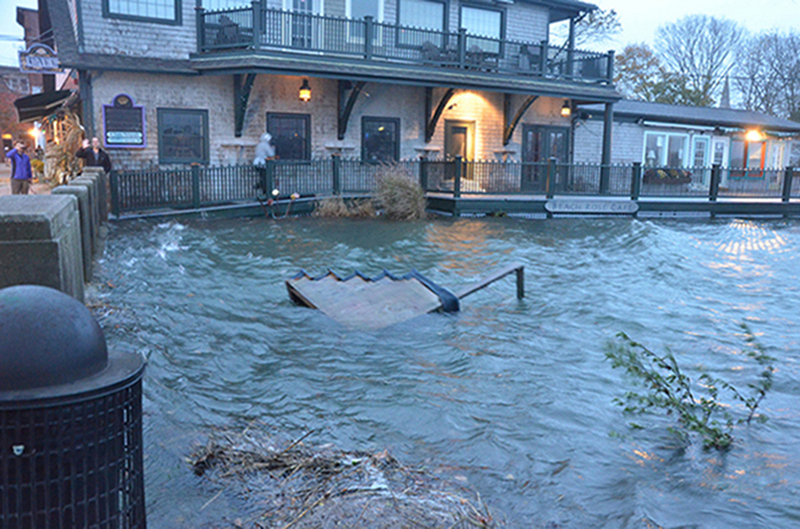 In Wickford, a village in North Kingstown, the 2-3 feet of sea-level rise projected by 2050 would put the town dock underwater and threaten more than 100 properties collectively valued at between $68 million and $95 million, according to a story in the Winter 2018 edition of 41˚ North. The story also reported that 3-5 feet of sea-level rise statewide would compromise nearly 100 miles of road, an amount that doubles at 7 feet of rise. At that level, much of downtown Providence and the ports of Galilee, Quonset and Providence would be underwater. Nearly 7,000 people live in those flood zones. The rising sea will leave about 760 million people, some 10 percent of the world’s population, homeless in the next century, according to Climate Central, an independent New Jersey-based organization of scientists and journalists researching and reporting the facts about the changing climate and its impact on the public. Despite a deluge of verified scientific data regarding climate-change impacts and their related costs, free-market capitalism continues to hold real solutions hostage. In the United States and in other parts of the world, the 2007-08 economic crisis, austerity measures and budget deficits are often the excuses used to slash climate programs. The world’s fossil-fuel companies have known for decades that their products warm the planet. Combined they have done little to address this reality, and, in fact, continue to stonewall most attempts to address climate change. Not a surprise, since according to Klein’s book, Big Oil’s top five pulled in $900 billion in profits between 2001 and 2010. “These companies are rich, quite simply, because they have dumped the cost of cleaning up their mess onto regular people around the world,” she wrote. To reduce greenhouse-gas emissions and address climate-related impacts in the ambitious manner required, considerable investment must be made now in composting and energy-efficiency programs, light rail and other public transit systems, smart grids and, most notably, renewable energy. Also needed are royalty increases on fossil-fuel extraction, carbon taxes and economic incentives for renewable-energy development. At his March 4 talk, Grantham noted wind and solar energy and battery storage are quickly becoming less expensive. “This is a done deal. We are going to decarbonize the electrical system,” he said. Mostly because this technology is becoming profitable. Unfortunately, homo sapiens are way behind in the climate-change race. One of the areas Grantham believes will lead this transformation is offshore wind — an energy source that up to a year ago the Westport, Mass., resident didn’t believe in. 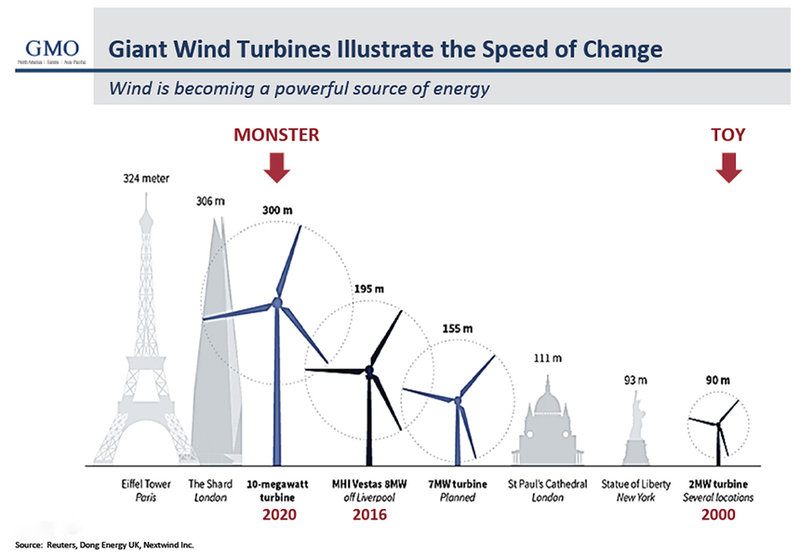 The offshore “monsters” Grantham supports would tower over the five Block Island Wind Farm turbines. He talked about turbines as high as 900-plus feet, each generating 9.5 to 12 megawatts. The five Block Island turbines, each 600 feet high, combined are 30 megawatts. Only because, as Grantham noted, it will be profitable.